The stunning Grade 1 listed neo-classical Victorian building that houses the museum and art gallery was built from a bequest by the lawyer Edmund Harris, who wanted a free library, museum and art gallery to be built in memory of his father, who was the vicar of St George’s church in Preston for most of his life. The building is arranged around a circular central void and exhibits are organised over several floors. Being a museum and an art gallery, it houses a large range of exhibits; as well as the Mrs French perfume bottle collection, which is the largest in the country; there is an important collection of mid-20th century fashion dresses by the famous Horrocks’ label and other exhibits concerning the cotton industry. The photography collection includes prints of the Crimea by Roger Fenton and in fine art, the largest collection of work by the Devis family is found here. Many of the artefacts were donated by local people; in particular I was drawn to the temperance memorabilia; the Temperance Movement started in Preston. This delightful building has something for everyone; children and young people are particularly well catered for with regular tours given by the enthusiastic young curators and extra activities organised by the Preston Hands On Gang – an association of five tourist attractions – four museums and a steam railway. The Rotunda café is on the ground floor right in the middle of the museum; other facilities include baby changing and a shop. 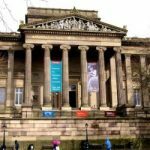 Forget misconceptions about museums being boring, shut down the computer and the Wii and visit this museum; it’s right in the middle of Preston and entry is free. A small charge is made for extra activities.